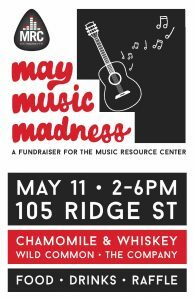 Help us ring in the warm weather with May Music Madness, a magnificent meetup of music, merriment, maybe a mite of mayhem, and marvelous morsels! Join us for live music, food trucks, and raffles in the LeRoi Moore Performance Hall at the Music Resource Center! Tickets are $12 in advance, $15 at the door! Kids 12 and under and MRC member are free. More details on raffle coming soon! !